Note from shop owner Ply is on holiday. Absolutely wonderful! Super cute I love both necklaces! The ring is truly beautiful! Thank you! This item fits very nicely on the top part of my ear. 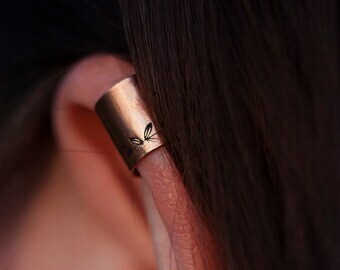 It’s very comfortable and I feel no discomfort as I do with other cuff earrings i’ve purchased. It’s also very stylish. We've moved away from bubble mailers and glossy business cards, finally! We've got home-compostable mailers, innovative Geami kraft paper wrap, and business cards printed on 100% recycled card stock! This has been a big project with lots of research, planning, and missteps, over the last few years. We're so excited to finally be sending packages out into the world that represent our ethos and priorities! Ply is a business of two based on a 7 acre alpaca farm in Pahiatua, New Zealand. We specialise in hand stamped copper and sterling jewellery - and words. The words can be anything - quotes, lyrics, nonsense, numbers - because the really interesting part is what they mean, how that meaning can change, and how they change you when they're worn. Obviously, we love custom orders. Each piece starts as a sketch. It is then hand cut, stamped, hammered, treated with a patina, polished, and waxed. This is all done in a converted bedroom studio, looking out over a paddock of alpacas (with the occasional chicken, cat, or duck). Kate is the heart of Ply. She brings a poet's love of words and a metal smith's love of hammers to each piece, often listening to music or a podcast while she works, and takes breaks to watch the alpacas in the paddock. Heather is Ply's pulse. She keeps Kate going with cups of tea, head scritches, and enthusiasm. When she's not behind the camera or using washi tape on parcels, she's probably in the closest patch of sunlight, knitting, reading, or napping. We accept refunds and exchanges, except for custom or personalised items. We do everything we can to make sure you're happy with your purchase before we send it. However, if you're not satisfied when you receive your item, please convo us and we will do our best to resolve the issue. Return postage (and postage of a substitute item) will need to be covered by the purchaser. We make all of our jewellery by hand, and then post from New Zealand, so please keep this in mind when making your order. If you have a deadline, please contact us before you buy so we can work with you to get your item to you on time. Shipping within New Zealand is sent ParcelPost Tracked with NZ Post and takes up to 3 working days. Please contact us before purchasing if you would like to upgrade this to tracked courier. Shipping outside New Zealand is sent by International Air and should be delivered in around 10 working days. If you would like to upgrade the postage to International Tracked Courier, please contact us prior to purchasing so that we can update the listing for you. This upgrade can add upwards of $20USD to the price of postage. If you don't receive your item in 14 workings days (or 5 working days for orders within New Zealand) from the shipping notification, please contact us so we can investigate and (hopefully) resolve the issue. Unfortunately we can't take responsibility for items lost in the post, but we will do everything we can to make sure your order arrives.